We all know that keeping your house clean and looking good is an ongoing process; it takes work. However, that doesn't mean that cleaning needs to take up all of your free time. Make your dusting as efficient as possible with Molly Maid's three ways to save time when dusting and reclaim your free time today! Dust before you vacuum. As you dust, bits of dirt and dust will fall to the floor. By dusting first and vacuuming second, you won’t have to vacuum the same floor twice. Use microfiber. For best results use a damp, clean, microfiber cloth. To dampen the cloth, hold the cloth by a corner and lightly mist it with clean water from a spray bottle. You want the cloth to be damp enough to pick up dust without leaving moisture streaks behind on surfaces. 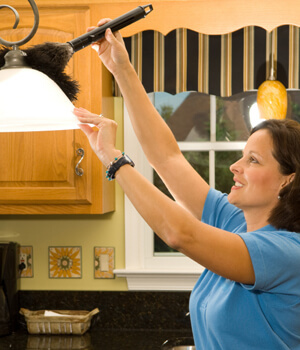 Using this method will ensure that your home's surfaces and furniture are cleaned in a safe and green way.